The plot involves special agent Doug as he tries to solve a case before it even begins. A terrorist attacks a ship and destroys over 500 people in the process. Nobody knows who did it or where the person went, which is where Doug comes in. Doug is the first person to confirm that it was a terrorist attack and he is then brought on to the elite squad. With the use of satellites, they can watch just about any spot on the planet as of 4 days ago. So, they can wait 4 days to see who did it, but it may be too late by then. Moreover, there is no rewinding available so they need to be able to identify the person right away. The plot thickens when Doug finds out that another person was murdered prior to the explosion and thrown into the ocean to make it appear as if the person was just another victim. Doug is now personally invested in this case and he’s ready to solve this case. Now, what if there is more to this satellite technology than meets the eye? What if Doug can stop the crime before it starts? That’s when the real film begins! Well, the satellite thing is actually pretty scientific. I recall reading about it recently that at least 4 satellites are typically trained on the area. From there, it gets a little hazy since I don’t really think that the satellites would typically be able to look through buildings and get clear 1080P footage while you’re in a dark alley at night. It’s certainly possibly in theory though and it’s interesting to think about. If our government actually had perfected the tech to this extent though, the world would either be a really good place or our civil rights would be even more dismantled than they currently are. (America is still one of the best at protecting us though) Things get more than a little hazy once they start explaining about how you can actually look at the past with the satellites. That means that it’s fiction time! I do give Doug credit for deciding to change the past while the others said that it wasn’t possible. If time travel was actually possible, then I definitely think it could be altered. The two events go hand in hand. If you can go back in time, then you can change it. If not, then time and the events within it are simply unchangeable. That’s always been my stance on the matter. Doug is a decent lead. He definitely wants to solve the case and he’s ready to do whatever it takes to succeed without doing anything that’s really unheroic. This is the kind of character that you could call a little generic and get away with it. There’s nothing about him that really stands out and he’s only decent in a fight. His final stand off against the main villain was actually pretty bad since he was on the defensive the whole time. One could argue that his end is also a little tragic and not what you would expect while others can argue that it had to happen due to the plot. I dunno, I think he could have put in the extra effort and just moved to the Hotel California to avoid any missteps. Oerstadt is the terrorist in the film and he’s as crazy as you may have expected. I doubt I’ll ever like a terrorist character in a film and that’s a good thing. Films shouldn’t even try to make them sympathetic or likable since they’re just bad people when it all boils down to it. Oerstadt is certifiably insane as he wants to murder everyone to show the United States that they need more patriots. He wants them to wake up and start controlling the world since they have the power. Instead, Oerstadt is woken up to the fact that he didn’t think this through and that his only escape options are death and life imprisonment. Not the best set of options right? One of the complaints that I would have with the supporting characters is that they can be slow on the uptake. Take Doug’s partner. He gets a message informing him that a terrorist is going to blow up the boat so he heads there to stop him. He sees the guy get into the van so he runs towards him. “Stop….Stop…hands in the air” is basically what the agent says. The guy just takes out his gun and shoots him…..eh? When you’re dealing with a terrorist, you quickly let everyone know and you don’t just walk up to the window. At the very least, shoot all of the wheels so that the guy can’t escape. Then, don’t go in front of the window so the shot will at least be a little more difficult. This guy was an agent so I’m sure that he’ll have enough connections to inform the NSA that something’s up. The film is also pretty gritty. The main heroine’s plight is pretty serious and the partner’s demise is also pretty gruesome. The film shows the aftermath of the terrorist attack and it’s grim as you would expect. They don’t want to make light of such a situation, but these three scenes are still not really any fun. The heroine’s plight happens twice. The first one is off screen and then we see part of the second until the guy is interrupted. That was good at least, but it’s still a bit much since we know what would have happened. There’s not much of a soundtrack of course. Luckily, that was to be expected here. We had a bit of a red herring involving the main agent in charge since he acts incredibly suspicious the whole time, but his plot never amounts to anything. At least it gives the viewers something to think about. His role is very small and I still wonder if the writers just forgot about him. 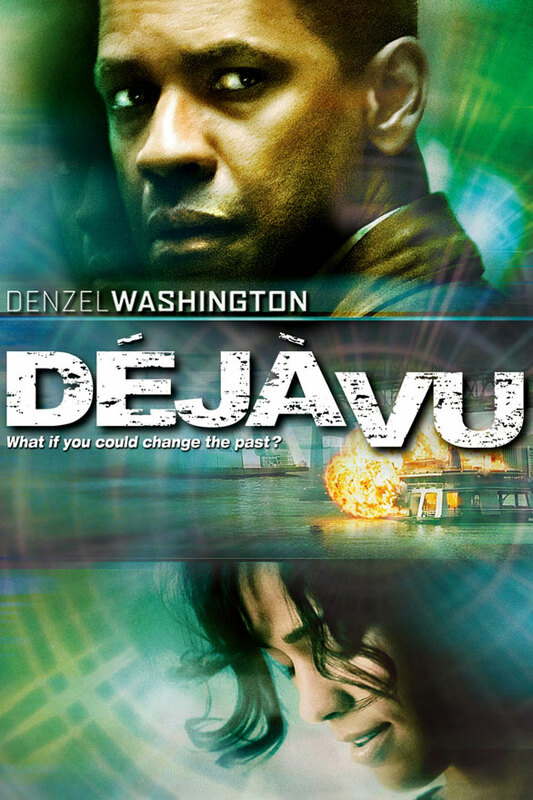 Overall, Deja Vu is a pretty standard film. It does end up losing some extra points for the gruesome violence and the fanservice though so it ultimately becomes a little sub par. The main character wasn’t bad and I always like a good time travel story, but the film just wasn’t terribly exciting or interesting. You sort of want to find out what’s going to happen, but you’ll find yourself to be pretty detached from the current events. It’s hard to really get into what’s happening and you could say that it’s a bit of a negative. A film should really keep you on the edge of your seat. An example of this is the big car chase scene. It’s a fun concept, but it’s not as thrilling as you would expect. Maybe the cars just weren’t going fast enough or it’s because I already saw Need For Speed. Well, I wouldn’t really recommend this one and I think you’d be better off watching The One for parallel universe explanations. This entry was posted in Live Action Movie Reviews, Reviews and tagged Deja Vu, Denzel Washington, Explosions, Film Review, Movie Review, Review, Sci-Fi, Thriller, Time Travel by dreager1. Bookmark the permalink.